Meklit Gebru grew up in Georgia. She majored in International Economics and Modern Languages with a Spanish concentration at Georgia State University. During her undergraduate career, she took courses such as The Herndon’s Human Right Legacy that helped her connect the American Civil Rights, and Women’s Right Movement to modern-day human rights problems such as political, educational and economic oppression. She was also selected to participate in the WomenLead Program that helped her enhance her skills, and experience to achieve leadership roles through mentorship and women empowerment. Her studies ignited her passion for providing service for people in need. Meklit became interested in the Foreign Service when she studied abroad in Costa Rica as a Gilman Scholar. This experience sparked her interest in international development work. It was during her service project for Gilman that she realized that there is a substantial need for women and men in emerging countries to have a support system to continue their education. 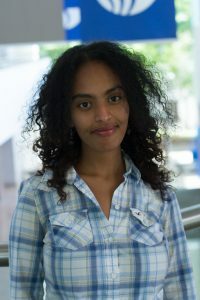 As an Ethiopian American and a first-generation college student, she was able to relate to some of the challenges that women and men in emerging countries face when it comes to pursuing their education. During her last semester at Georgia State University, Meklit studied abroad in Mexico. While studying in Mexico, she learned about modern-day femicide that continues to affect girls and women in Mexico. Through this experience, she learned that gender inequality issues are prevalent across the globe. She will pursue a Master’s in Public Policy so that she can use her experience to shape policies to help vulnerable populations. Meklit is excited to have the opportunity to work as a USAID Foreign Service Officer to address pressing global challenges such as gender and education inequality. In addition to English, she speaks Amharic and is currently studying Spanish. In her spare time, she enjoys watching comedy shows and attending plays. She is eager to continue the legacy of Congressman Payne.